It’s been a busy week for multi-tasker Donnie Wahlberg. 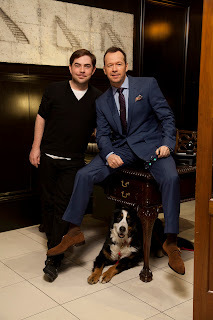 The star of CBS’s “Blue Bloods” — who’s also executive producing TNT’s new drama “Boston’s Finest” and preparing for a summer tour with New Kids on the Block — was in town over the weekend for a photo shoot at XV Beacon (below) that will appear in CBS Watch magazine. He was joined for the shoot by Heidi, the Bernese mountain dog that belongs to XV Beacon’s general manager, Amy Finsilver. By Monday, Wahlberg was already back in New York. He tweeted Monday afternoon, “Wrapped #BlueBloods for the day! Off to . . . brainstorm for #ThePackageTour. Then to @TheDailyShow with Jon Stewart!” The guy is productive. The Boston Herald also posted an article about Donnie's Watch photo shoot. More reviews for "Boston's Finest"
An article posted on Grub Street says Donnie Wahlberg randomly sent the Globe a box of doughnuts. Here is another one from a couple days ago with his new Blue Bloods partner - Marisa Ramirez from Jordan Knight's "Give It To You" video. Tomorrow is the premiere of Boston's Finest on TNT, and Donnie will be on the Today Show tomorrow morning.